OK! I finally had a few minutes to be creative. Today's card comes from the "Mojo Monday Sketch Challenge" blog. Yes, I know it's not Monday BUT there are so many wonderful sketches on there that I figured I'd try one out today anyway! I was having a hard time choosing which sketch to use so I decided I'd use my wedding anniversary date. My anniversary just so happened to be on a Monday this year! Today's card will be delayed until a little later this morning/early afternoon. My son has orientation for the Middle College today and my daughter will be attending her first day of College so I needed to be up earlier than usual. I'm sure after they get home we will need to go buy more supplies. I promise I won't make you wait too awful long! REMINDER: There are only 2 days left (today and tomorrow 8/31) to take advantage of the Spooktacular Halloween offer for new recruits. If you have ever thought about becoming a Demo- now is the time to do it! Not only will you get to choose $125 worth of products (yes- your choice!) but you will also receive the ever so adorable Halloween Printers Tray Kit which comes with the supplies necessary to create your own masterpiece! Did I mention that shipping is FREE? Today, I created a card that uses multiple punches. Punches are great because they enhance a stamped image by cutting coordinating shapes. I love to use punches because they save time and the shapes layer perfectly. The card below uses 7 different punches. I hope everyone had a beautiful weekend! Here in Michigan, the weather was absolutely perfect! The temperature was in the mid to upper 80's and the sun was shining bright! These weekends are becoming few and far between! Today my card comes from the Carry On Hostess set in the 2012-2013 Catalog. The set was unavailable for a while but it's back now! Get it while you can! Hello! Thanks for stopping by today! I have a cute project to share. It's a miniature tissue box! It holds one of the purse sized packs of tissues. What a cute idea to set on your desk, toss in your purse, etc... I got the idea from Lyssa Zwolanek. I love these because not only are they cute but they are also refillable! The individual tissue pouches just slide in from the side. Wouldn't these be cute to put in your child's backpack? You could totally customize it with the school colors! Just change the card stock and add some ribbon and voila! Hopefully everyone has had a great week! I'm still in catch-up mode from vacation but I'm finally almost there! Today I have a card that I CASE'd from the 2012 Holiday Catalog. When I first saw this set- I knew I had to buy it! It's absolutely beautiful! I decided to use my Champagne Shimmer Mist spray and I also added Soft Suede ink around the edges of the sentiment pennant. I love it! Looking to follow my blog? It seems that my "subscribe to my blog" button was a little difficult to find. The button has now been moved to the left sidebar. Hopefully everyone can find it now! All you have to do- is enter your email address and hit submit! I apologize for any confusion this may have caused. I also would like to thank everyone for the comments that I have been receiving. I LOVE to read each and every comment! Comments are important to me as they help inspire me to be more creative! Lastly- Have you made an ornament using the Halloween Ornament Tutorial that I created? I would LOVE to see your work! Please email me a picture and I would be happy to upload it to my blog for all to see! I have a card to share today that I'm VERY excited about! It's a Christmas card that was designed by the fabulous Melissa Stout. I actually found her video for this card on the Stampin' Up! Demo site (Stampin' Connection) and was in awe over how absolutely awesome this card is. I love this card because the finished product looks sophisticated and fancy but is really easy to re-create. On Melissa's card- she used a Peppermint Candy embellishment from the Sweets for the Sweet stamp set. I don't own that set so I used a Brushed Bronze button and a Cherry Cobbler Bakers Twine bow instead. I can't believe the week is already half over! Seems like it just started. Before you know it- the kids will be back in school! My daughter Amanda starts college in a week and my son starts a new program called the "Middle College". This year will mark Cameron's first year as a high school student. However he's not going to traditional high school. He applied for and was accepted into a program that's been around in the Monroe area for 3 years. He will attend classes at the Monroe County Community College for 5 years. In return for good grades and lots of hard work- he will be awarded not only a high school diploma but also a 2 year associates degree in the Health Services field. (Someday Cameron hopes to become an Anesthesiologist) So basically he will graduate a year after all his old classmates but will be a year ahead of them as far as college education goes. Did I mention that this program is FREE? How awesome is that? Cam gets 2 FREE years of college education. Definitely a huge plus these days! In other news, I have been playing around with my new Stampin' Up! goodies that came while I was on vacation. One of my new favorite tools is the Candy Wrapper Bigz L die. I could sit and play with it for HOURS! The little candy wrappers are absolutely adorable and so very customizable! You can make them for absolutely anything! I know I'll definitely be making lots for the upcoming holidays- both Halloween AND Christmas! I hope everyone has had a wonderful day so far! I have been working on all kinds of projects for today. What I really need to do is come up with my swap card for the Stampin' Up! Regional in November. Yes, I know that November is a long way away but I like to be prepared! The card I am going to share is a card that I can't decide if I like it or I don't. I love the stamp set used, the color combination and the idea behind the card BUT... Do you like it? or does it need something? REMINDER: There are only a few very short weeks left to receive the absolutely adorable Halloween Printers Tray for joining my team! There is a Stampin' Up! opportunity that will fit YOUR lifestyle! You are welcome to give your business as little or as much attention as you would like! Please call (734) 497-8521 for more details! There is NO OBLIGATION and I promise it will be a LOT of fun! ALSO: If you would like a copy of the 2012-2013 Stampin' Up! Catalog or the 2012 Holiday Catalog (or both), please either email me (the email me button is on the right sidebar) or call me at (734) 497-8521 and I will get one out to you immediately! Today I have a project to share. It is an advent calendar for Christmas. The original idea is not my own. I used the tutorial posted by Brenda Quintana. I loved the idea from the moment I saw it! I just *had* to order all the supplies to make one! I hope you enjoy! I will be back later today with another post to share with you. Enjoy your day and remember to check back later this afternoon! After a crazy cross country vacation- the last thing I expected when I came home last week, was to find out that we would be having company in less than 24 hours. I wasn't ready for visitors and neither was my house! I had already been gone for almost 11 days and nothing was in order. So I had a ton of cleaning, laundry, and a box full of new Stampin' Up! goodies that needed taken care of. All I wanted to do was play with my new stuff! Unfortunately I didn't get a chance to do so. Not until today! It's Monday and my company is now gone! (sorry if I sound a little excited...I can't help it!!!) This means that I will be stampin' all day long! REMINDER: Tomorrow (Tuesday 8/21) is also my weekly "Come Stamp with Me Tuesdays" event. It starts at 6:30pm but you are welcome to join in at any time! Lots of new goodies for you to come try out! Make a few projects and have FUN! As always- you are welcome to bring a friend! WOW! It seems like forever since I've posted to my blog. My family and I went on a family vacation on Sunday August 5th and were supposed to be back on August 11th but it didn't work out that way! My hubby and I were having so much fun in all the cities that we visited so we decided to extend our trip and head to Los Angeles, CA too! It was a super long (and I do mean LONG) drive but it was well worth the fun! We saw several Jack White concerts, the Denver Zoo, Vegas, and finally a trip to Disneyland. Disney is my favorite place so of course I had to go there too! When I arrived home late last night, I had a box of new Stampin' Up! goodies waiting for me! I have spent most of my day today assembling and organizing my new items. I will resume my normal stamping routine tomorrow! I don't have a card of my own to share today but I do have a swap card that I received from another Stampin' Up! Demo. I love the layout and colors. It's lovely! Hello and thanks for checking in! As you all know- the new 2012 Holiday Catalog went active on August 1st. Several of my fellow teammates and I participated in a team card swap that features card designs created from the new Holiday Catalog products. Above: The card on the left was created by Jen and the card on the right was created by Sharon. I love them all! Each card has it's own unique design and I love that even though we all have the same basic tools/stamps/cardstock/etc to work with- we each come up with something different! I'm glad I participated in the swap! It was a lot of FUN! Today I'd like to share a card that is made from a set called Pennant Parade. It's not a new stamp set but it's super cute and so very versatile! The stamps in the set can be used to make Christmas cards, Ice Cream Cone cards, Party cards and so much more! I chose to make my card a Christmas card. I've been on a holiday kick ever since the Stampin' Up! Demo's received their copy of the 2012 Holiday Catalog. I love the holiday season and am always trying to come up with cute ideas to share. I hope you enjoy! YAY! The end of the week is finally here! Thankfully I love the hot weather because today- it's going to be sunny and 90 degrees! That means that I get to stamp most of the day! I say "most" of the day because before I can stamp, I'm going to watch my daughter play in the USTA Districts for her Women's Tennis team. Amanda is only 18 but that's the age that one can start playing on the adult league. She is playing #1 singles! The project that I'm sharing today isn't completed yet but it's getting there! It is a mini Christmas tree made from rosettes. I still need to decorate it. I think I'll add some ribbons and a few other embellishments. Perhaps some glitter, a tree base and some presents to go underneath! I got the idea from a local craft store but at the store- the tree wasn't decorated and it didn't have a base. Today I'm going to share a card that I somewhat CASE'd from page 41 of the 2012-2013 Annual Catalog. The card in the catalog- features a cute flower pot that was cut from card stock then attached to the card. I used a different layout, different colors, a different stamp set and different embellishments. Simple yet cute! It's August 1st and that means lots of new and exciting things happen today! 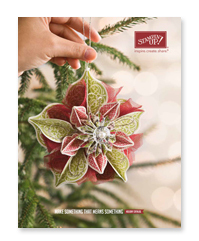 First- today is the first day that you can order from the 2012 Holiday Catalog! There are so many awesome products! I want them all!!! I have posted several samples that featured products from the Holiday Catalog in the past few weeks so hopefully I have given you some ideas. Second- today starts the Spook-tacular Howl-O-Ween promotion and when you join my team you will get this cool printers tray kit absolutely FREE! Remember- the Demo Starter Kit is FULLY customizable and you get to choose $125 worth of products for only $99! Shipping is INCLUDED! There's a demo option for everyone! I promise! Today is also the official release day for the My Digital Studio2 digital release. Don't know if you'll like the software? Go ahead and get the FREE 30 day trial version. Check it out and see for yourself! It is AWESOME! The possibilities are endless with this program!